For years since its foundation, the IAEA has earned great respect as an organization able to address a wide range of civil nuclear issues. 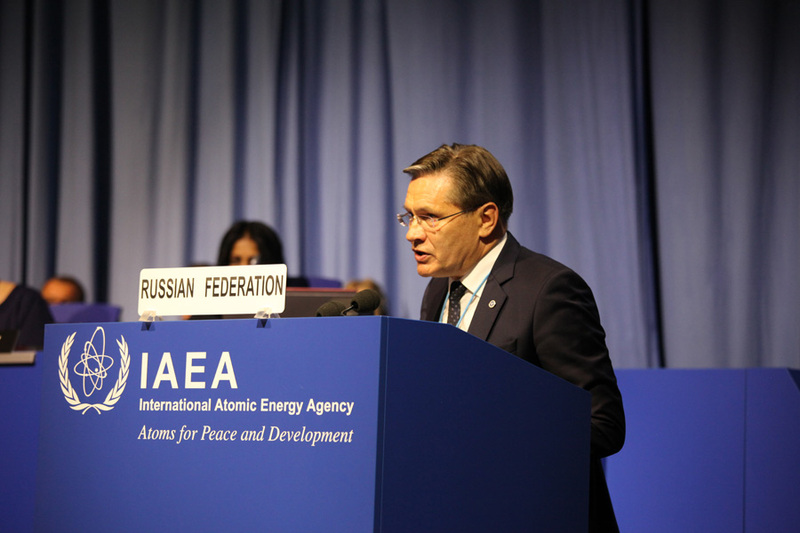 Russia has always supported and continues to closely cooperate with the IAEA. Specifically, we finance large technical cooperation projects, Nuclear Security Fund, Russia’s Support Program to the IAEA safeguards, cancer treatment programs, INPRO (International Project on Innovative Nuclear Reactors and Fuel Cycles). Russia’s contribution to the agency’s budget exceeded 17 million euro in 2018. We place much importance on the IAEA’s efforts in implementing safety guarantees. This part of the agency’s work is essential for adherence to the NPT. All the documents now developed and approved by the IAEA are the result of thorough discussion and consensus between the member states. We support such a professional and non-politicized approach used by the agency, its management and experts, and are certain that this approach will be preserved. Nuclear energy is a sensitive industry. We have to deal with enormous amounts of energy. All projects we deliver in and outside Russia are meant to work for decades. This is why it is critical for rapid global development of nuclear that the industry is safe from political impacts. Russia supports the statements made in the final document of the IAEA Ministerial Conference in Abu Dhabi. We are pleased that it has been confirmed that many countries regard nuclear power as a proven, clean, safe and cost-effective technology which will be of great importance to energy security and sustainable development in the 21st century. Many goals have been achieved in the year since the previous General Conference. In the first quarter of this year, Russia has brought online and started the pilot operation of Unit 4 at Rostov NPP and Unit 1 at Leningrad II. This is the second Generation 3+ nuclear power unit we have started up. In July, a landmark event took place in Murmansk as nuclear fuel loading began at Akademik Lomonosov, the world’s first floating nuclear power station which will soon be transported along the Northern Sea Route to the city of Pevek. Small-size nuclear reactors are of great use to energy deficient regions where there is no necessary infrastructure and construction of large power generation facilities is unfeasible. The new product we are offering is a floating nuclear power station based on RITM-200 reactors. Its capacity has been increased to 100 MW. In order to comply with the requests of our partners, we have also started developing a stationary reactor with the same specifications. As the world’s first facility of its kind, our floating power station is creating a global trend for use of small-size reactors. In the years to come, this may usher in a whole new era of small-size and low-capacity reactors. Russia continues to support nuclear power industry development in other countries. “First concrete” was poured at Turkey’s Akkuyu, Roopur in Bangladesh, and one more power unit of India’s Kudankulam. The active construction phase has started at Units 2 and 3 of Bushehr NPP. Construction operations are underway at Hanhikivi-1 in Finland, Paks II in Hungary, and the Belarus NPP. A set of documents has been signed with China. An agreement on construction of Uzbekistan’s first nuclear power plant was signed very recently. Russia provides support to countries interested in non-energy use of nuclear technologies. We offer such countries our projects for construction of centers for nuclear science and technology. The centers are meant for developing science, medicine and irradiation technologies for industry and agriculture. Rosatom has concluded contracts for construction of such centers with Bolivia and Zambia, maintains relevant cooperation with Vietnam, and is starting to work in this field with Nigeria and Mongolia (several agreements and memoranduma have already been signed – Rosatom Newsletter). We regard efficient disposal of spent nuclear fuel as the main challenge of the near future. We are convinced that this can be achieved by gradual transition to dual-component nuclear power systems with closed nuclear fuel cycles. Russia already operates BN-600 and BN-800 sodium-cooled fast-breeders. In Seversk, we are running the Proryv Project, an ambitious pilot center comprising fast neutron reactors and facilities for MOX fuel fabrication and spent fuel reprocessing. Rosatom has developed the technology for production of mixed uranium plutonium nitride fuel, which is the best option for fast-breeders. We also offer our partners SNF reprocessing services with introduction of uranium and plutonium in the fuel cycle and radioactive waste conditioning. All that activities ensure that, nuclear energy remain competitive for decades ahead. This spring, Rosatom held a large scientific conference in cooperation with Kurchatov Institute and Russia’s Ministry of Education. Two main conclusions were made during the conference. The first one was that the key areas of development were hydrogen-based nuclear energy, plasma technologies, and controlled thermonuclear fusion. The second conclusion was that a major breakthrough in nuclear technologies could be ensured by bringing together pilot technologies and research infrastructure both in and outside of Russia. For this purpose, it is also necessary to consolidate professional competencies. With this in mind, we welcome the 1st IAEA Ministerial Conference on Nuclear Science and Technology to be held in November, and intend to take part in the event. One of Russia’s priority nuclear research projects is the international research center based on MBIR, a multipurpose fast-neutron research reactor which is now under construction in Dimitrovgrad. The reactor has been included in the list of facilities to be available for international use under the IAEA international research center program.